Cardamom is a well-known spice in the Middle Eastern and especially Indian cuisine, where it is used in many meat dishes, desserts and drinks. The tingling taste of the spice invites you to experiment – add it to a simple pumpkin soup, your morning smoothie or even a cocktail, and you’ll be blown away. The power of cardamom doesn’t end with its exceptional taste properties and there are much stronger reasons for the love and frequent use of it. We tend to forget that spices are a science and if applied with knowledge they can make us healthier and stronger. Cardamom is widely used in ayurvedic medicine and if you learn just a little more about its health benefits, there will be no questions left why there should always be a few cardamom seeds in your morning cup of tea. Cardamom is great for your digestion. One of the possible reason of its wide use in curries (besides the taste) is that it smoothens the properties of garlic and onions, which normally can cause digestion and gas problems. You can use it as a remedy, by adding to warm water along with clove and ginger and drinking it after a meal. Cardamom can save you from bad breath. In India this spice will often be offered to you after a meal – besides digestive benefits, it will keep your breath fresh. 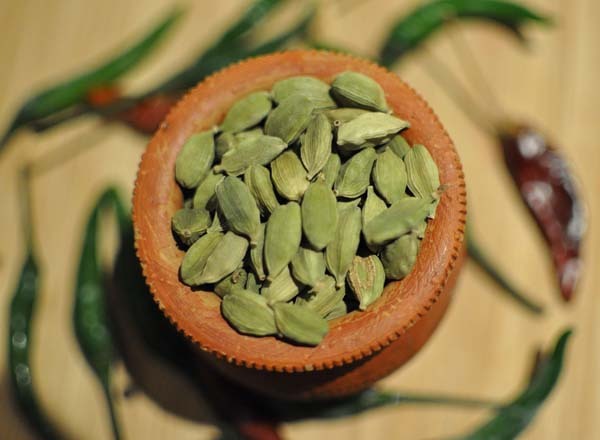 Cardamom can offer you relief from soar throat. It is coming from the same family as ginger and turmeric, and can serve as a medicine for soar throat and bronchial problems. Cardamom can help you fight depression. Its essential oil is widely used in aromatherapy. Cardamom is fantastic for detoxing. The spice is a great source of manganese, so if you need to clean your body – don’t forget to add cardamom to your smoothie. You can read detailed (and rather technical) description of volatile oils, minerals and vitamins which are contained in cardamom here. Enjoy your cup of cardamom tea!